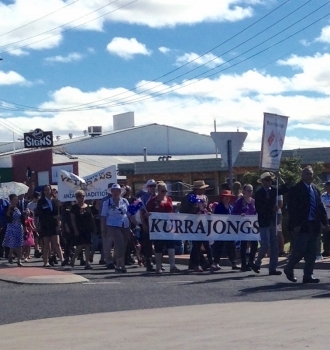 A large crowd assembled in the streets of Inverell to watch the 2016 Anzac Day March. Included were a small number of Kurrajong representatives led by Philip Plowman carrying our banner. At the Cenotaph hundreds of people crowded around to participate in the 11 am service which included a flypast of a C17 Globemaster plane from Amberley Air Force Base. Just prior to the commencement of the service Kurrajong committee members Brad Lewis and Daren Mather placed the committee's time capsule containing items from the re-0enactment, a list of the Kurrajong men, the names of re-enactment march participants and copies of the 2015 and 2016 Anzac Services held at Inverell, along with a newspaper account of the first Anzac Day Service held at Inverell in 1916. We also included two knitted poppies and a poppy cross, all carefully placed in a specially made stainless steel capsule.